I was going to make a sweater, but I saw this pattern and had to try it out. My boy would have loved this thing. In fact he asked me if I could yarn him one in his size. Heh. Like a sleeping bag? I asked. Except with lots and lots of yarn, he said. The phone is for scale. I have enough yarn to make another hat in reverse colors. 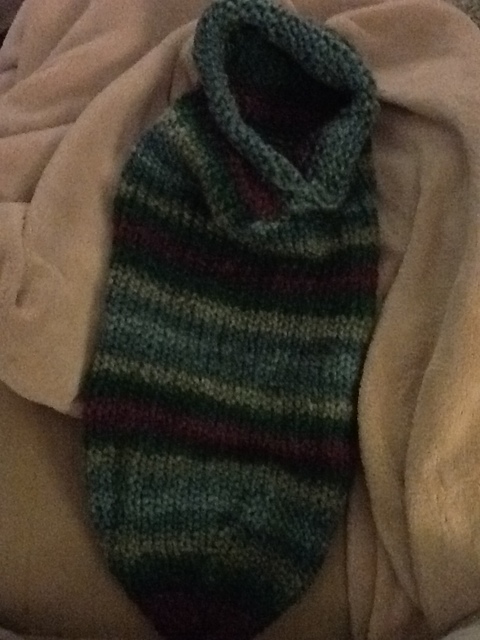 I already cast it on and intend to give it to super cute mini nephew. Not going to tell my sister though. Going to see if she reads my blog. Heh. So I’ve got an accompanying job this week. For years now I’ve played many different Missoula Children’s Theatre productions around town. It’s a touring group of 2 that come and teach a week long musical to local students. Definitely a high quality experience and worth your time if one comes to your town. Anyway, I’ve played the piano for them for about 14 years now and marvel that I still haven’t repeated a show. 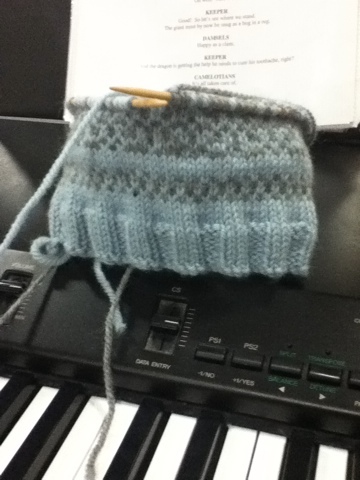 Anyway, in the early stages of rehearsal I get a lot of knitting done. 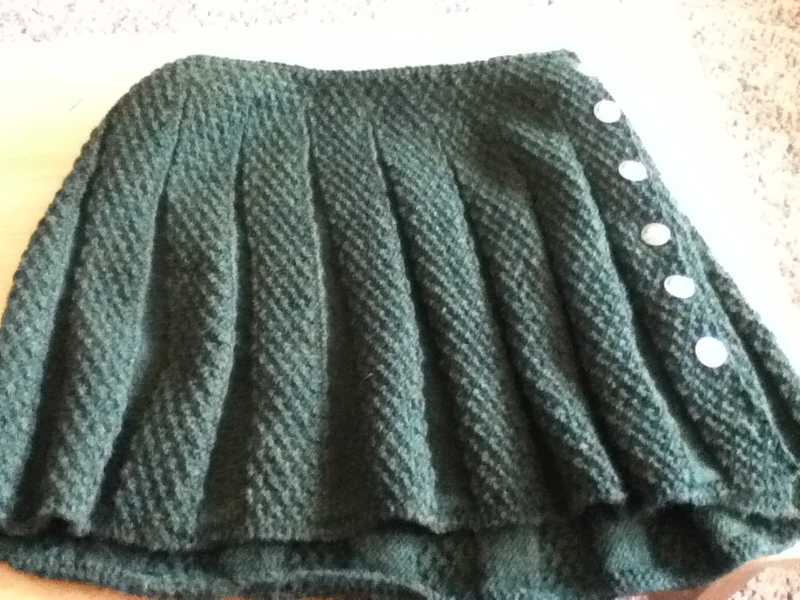 With the skirt finished, I needed a new portable project. 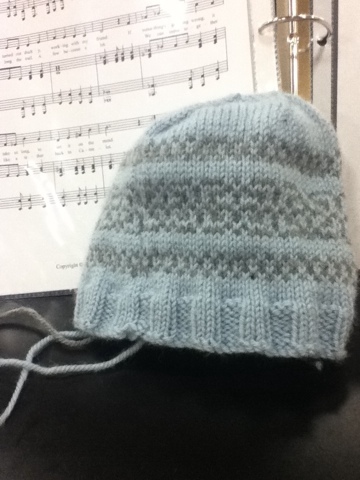 I started the fair isle hat for my friend’s baby to be. It’s a free download from revelry. I’ll try to remember to post a link. In other news, I got my first sunburn of the year. Woo. It was picnic day at school today and I sat outside with the kids. I so know better. Time to put a tube of sunscreen in the car for emergencies like that. I was wearing my compression sleeve so I now have a reverse truck driver tan. Again, woo. And speaking of compression sleeves, a little girl asked me about mine at rehearsal. She very seriously looked back at me through a darling pair of glasses and said, ” it’s ok. My eye doesn’t quite work like it should either. We’re lucky we caught it early. ” and skipped off to finish her dinner. Here it is. On an actual person. We need to redo the buttons, but all in all I think we’re both pleased. Hey look what I made! 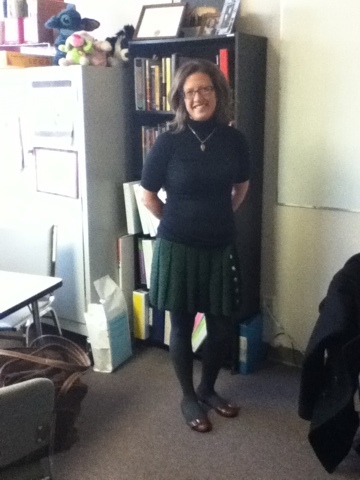 I started this skirt as a Christmas present for a friend of mine. So, um. Merry Christmas! Anyway, I finally got the ambition/buttons to finish it and sewed them on this weekend. 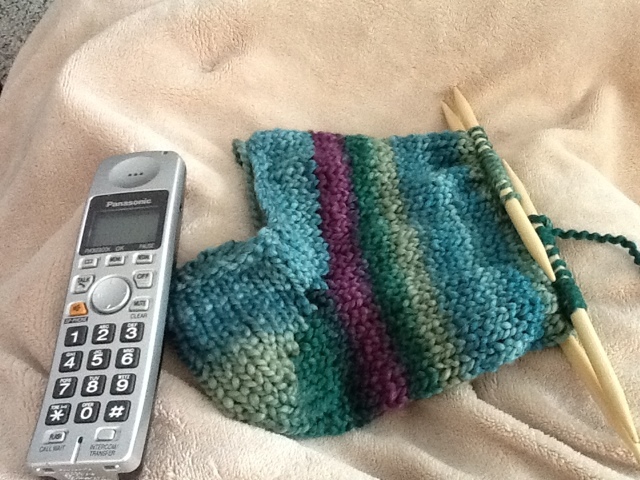 The pattern is Carnaby from Knitty and I would happily make it again. Mindless enough to do without thinking too hard (don’t have to carry the pattern around). Knit until it fits. The hardest part was tracking my friend down to do occasional fittings. Anyway, I’ll try to get her to model it for a better picture. The yarn is Lion Brand Woolease. Funny thing: The buttons are Buffalo Nickels. Made in Italy. I believe there was some eye rolling that I couldn’t see over the phone. Heh. So remember the camera I lost back in 2009? It turns out I must have put it in the jogging stroller zippered pocket. Now here’s the super amazing thing. I gave that stroller away. And before I did, I hosed it down. And my sister’s friend then hosed it down again. And then looked in the pocket and found the camera – which still works! So I have pictures of L during Tae Kwan Do (the only day she didn’t cry, I might add). But the happy finding things, doesn’t stop there. I DID find my Charmed Knits book. Sitting on the filing cabinet. In my room. Where I know I looked several times. I think it was under an invisibility spell. And here’s the kicker. I went to take a picture of the old camera for this post. And I can’t find it.